NC_NOW_Legislative_Update_#12.22Apr19.v2 includes the summary and listing of NC Senate and House bills. Written by Robin Davis, NC NOW Vice President of Political Action. The good news is that Governor Cooper has vetoed SB359, The Born-Alive Abortion Survivors Protection Act. The bill swept through the legislature last week at dizzying speed, and the Governor vetoed it almost as soon as it hit his desk. Women and Allies Show Strength Again at Raleigh Women’s March on 1/26/19! 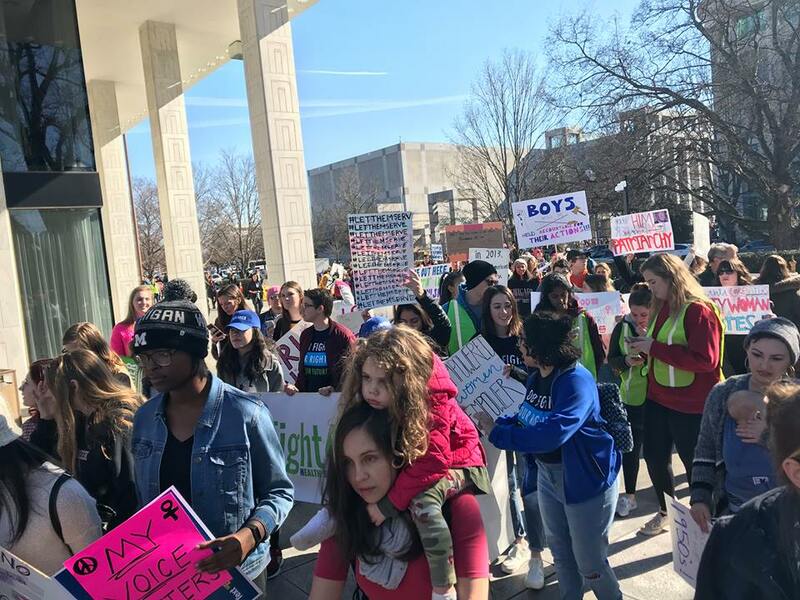 Thousands of marchers surrounded the NC Legislative Building while more waited and watched at Halifax Mall for the 2019 Raleigh Women’s March on Saturday, January 26, 2019. This is the third time women and allies showed up in the thousands in Raleigh to tell the world and the legislature that they are still fighting for change! Women organized women’s marches and rallies in at least 6 cities in January 2019. Here is a summary of the Raleigh event with theme, march, speakers, performers, signs. Even just the titles of the listed articles give you an idea how terrible this state budget is. This is the state budget for which the NCGA leadership subverted the process so there can be no amendments or discussion on it. NC NOW Vice President of Legislation Robin Davis described how this was done and why in the NC NOW Legislative Update for the Short Session #2. When she wrote it, most people, including Democratic lawmakers, had not even seen the budget yet! Now more people have seen it and many are angry and upset! These articles explain a few of the major issues being discovered in this budget that was written behind closed doors, and delve in if you dare! There have been some amazingly scathing articles on the legislative leadership (Senator Phil Berger & Rep. Tim Moore) circumventing the normal budget process. Berger and Moore and their buddies are shutting out the voices of citizens and other lawmakers. Here are 2 of my favorites. “Cut from the NC budget: Democracy,” News and Observer, 5/26/18, at http://www.newsobserver.com/article211879774.html. This is the NC NOW Legislative Update (dated 20 May 18) for the NC General Assembly’s 2018 “short session” which began on 5/16/18. 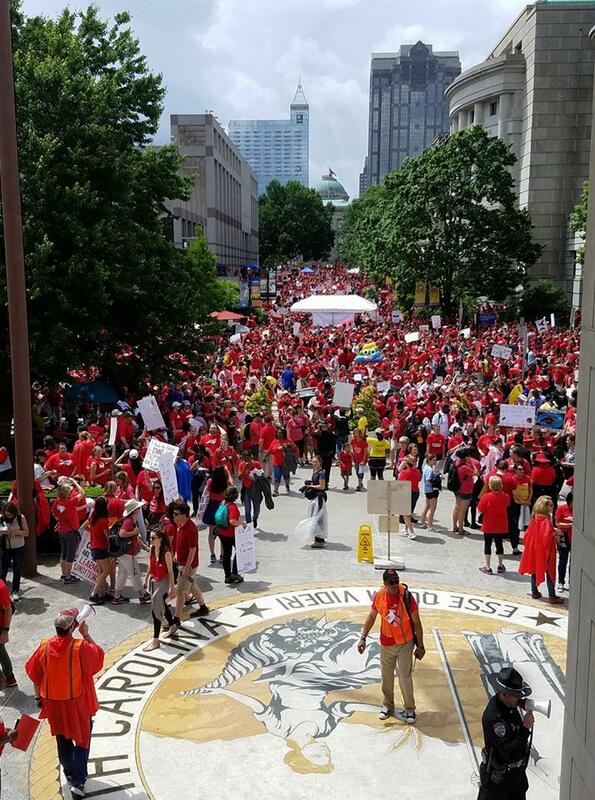 On opening day between 20,000 and 30,000 teachers from all across the state marched and rallied in Raleigh in support of higher pay for teachers and more funding for schools. Many took the opportunity to visit their representatives to explain that over the past 10 years teacher pay and per capita spending for students has actually declined when adjusted for inflation. The latest school massacre, which was in Parkland Florida on Valentines Day (2/14/18), may have more of a lasting impact that previous ones. The teen survivors are calling out the blame mongering and refusal of Congress and Trump to do their jobs in protecting children and teachers – and making a concerted effort to pull in others through social media. And they are not putting on a polite front in their speeches or in interviews. For example, teen survivor Emma Gonzalez gave an amazing, heartfelt, passionate speech calling out President Trump, the GOP, and the NRA for enabling the murder of children at an anti-gun rally. 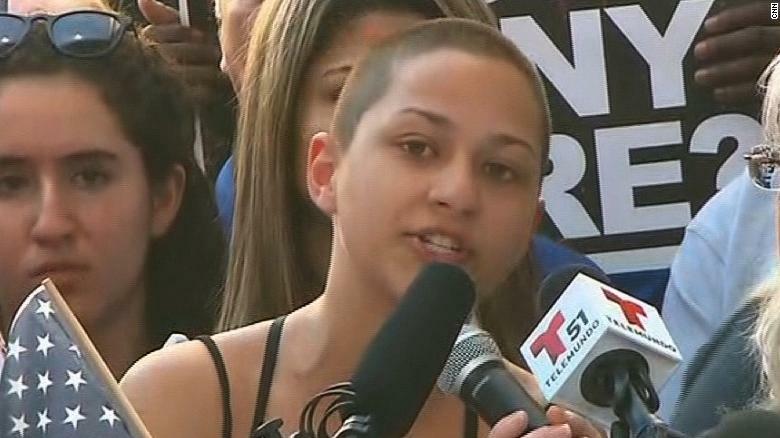 “How about we stop blaming the victims for something that was the shooter’s fault?” [Emma Gonzalez] demanded, and called out those who do deserve to shoulder that blame. NC Budget Summary from NC NOW Legislative Update #21 – 25Jun17. A budget has passed and has gone to the Governor, who has ten days to sign it, veto it, or allow it to become law without his signature. Governor Cooper is expected to veto the budget since he has been strongly critical of it: http://www.wral.com/cooper-calls-budget-deal-irresponsible-/16774013/, 6/20/17. But if the budget is vetoed, expect an override since Republicans hold veto-proof majorities in both the House and Senate. The budget intensifies the attack on women’s reproductive rights by appropriating $2.6 million to crisis pregnancy centers (CPCs) over a two-year period. 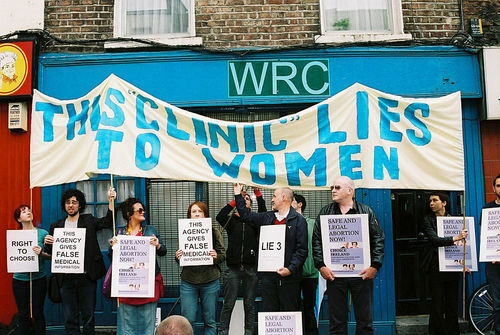 So-called crisis pregnancy centers are religious “ministries” that attempt to persuade women wanting abortions not to have them, often using scare tactics and false information such as claiming that having an abortion will leave a woman sterile or put her at risk for cancer. This appropriation represents an increase of one million dollars per year. See: https://www.indyweek.com/news/archives/2017/06/20/ncga-budget-gives-26-million-to-crisis-pregnancy-centers, 6/20/17. I am inspired by some of President Obama’s speeches, but appalled at his Operation Border Guardian which directs Immigration and Customs Enforcement (ICE) to take children (18 years old) and throw them in jails, sometimes private jails (even worse). In implementation, ICE is grabbing these teenagers on their way to school, off school buses, and out of stairwells at school – cases of these known in Wake and Durham counties. 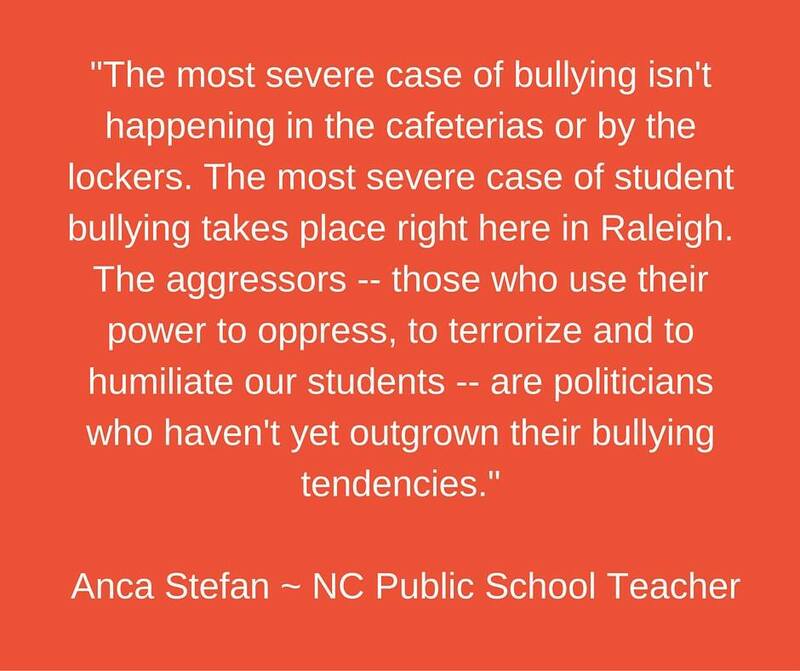 Our state conference included a workshop on what it took a Durham school community to save (or at least give a chance to) teenager Wildin Acosta (also one on racism). 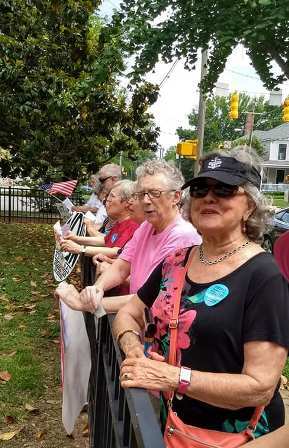 Read about the community effort at “In Defense Of Wildin Acosta,“9/26/16, northcarolinanow.org. We cover more about what is being done to these teens at “One saved, one lost of the NC 6 plus more,“9/26/16, northcarolinanow.org. The most heinous case I know came out of Durham County (probably because the Durham Community is fighting this). Here are some of the Durhamites fighting this! Give teacher raises with one hand, but with the other hand.. The Senate and House Budgets both give teachers modest pay raises, but continue to ignore most other school staff. Instead of hiring back the over 3000 TAs they forced schools to drop in 2013, they are proposing ways to ‘help’ after a problem has been manifested with “literacy coaches.” More at “Proposed House education budget cuts $27 million for reducing first-grade class sizes, reallocates most to literacy coaches.” At the same time, the NCGA plans to take even more money from public education. Teachers: Public school system in crisis. STOP. Send money! STOP. 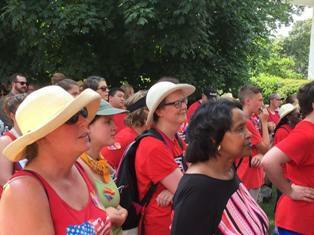 Educators and advocates in red are getting the word out in multiple ways about the state of public education in NC.